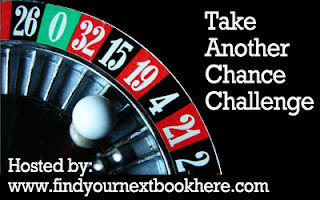 The Take Another Chance Challenge is hosted by Jenners over at Find Your Next Book Here. This is one of the more unique challenges I signed up for. There are 12 different challenges. The number of challenges you need to complete depends on which participation level you choose. For more detailed information click on the roulette table. Find an author who has either the same initials, the same first name, the same last name, or the exact same name as you. Read a book by this author and write a post about it. (If you try to keep your identity anonymous on your blog, you don't have to reveal what part of the author's name is the same as your name). The mere mention of historical romance made me throw up a little in my mouth but, after reading Sherry Thomas' book it's safe to say that I've had a change of heart. I've actually pick up some authors in this genre to give them a try. Find an anthology of your choice. Read at least 5 entries in the anthology. Of the 5 entries you've read, pick your favorite one and then find a book by that writer and read it. (If your first choice doesn't have a book, then pick your next favorite until you find a writer that has a book.) Write about the anthology, your favorite pick from the anthology, and the book you read by your favorite pick. Because of having to obtain and read two books, this challenge is worth two entries. 1 / 4 books. 25% done! Welcome to the Take Another Chance Challenge. I'm glad you decided to participate, and I look forward to reading your posts and seeing what books you end up with! Have fun with it. And I love the title of your blog! I say that about 10 times a day I think!